On An Overgrown Path: May I say a word about André Rieu? May I say a word about André Rieu? May I say a word about André Rieu? It is easy to look down at him and his style of presentation, to sneer at it as schlager or easy listening or glorified elevator muzak or whatever. I've done it myself. But, to my own considerable surprise, I find myself less and less sympathetic with such criticisms, and more and more embarrassed to have indulged in it myself. He is providing -- dare I say it? -- innocent, wholesome pleasure to millions of people, many of whom have never been afforded the opportunity to develop sophisticated classical music tastes. My mother-in-law, who grew up in a poor neighborhood near the Chicago stockyards and certainly never had exposure to classical music growing up, enjoys her Rieu CD and video very much. And the more I think about it, the more I can't find anything wrong with that. For it seems to me that to find fault with someone else's musical pleasure is at best presumptuous and at worst just rank snobbism. As much as I admire artists of uncompromising ideals, I can no longer be in sympathy with them when they tear down somebody else's aesthetic, howsoever "cowpat" they think it may be. This persuasive comment was added to Who is pushing the classical envelope?. I cannot disagree with Dave's reality check. But I would say that my post was about reaching young audiences and that the the point of juxtaposing Lady Gaga with André Rieu in the header image was not to take a swipe at him, but to suggest that classical music needs to come up with something much more radical than André Rieu if it is to break into the youth market. Yes, he sells shed loads of records, gives people pleasure and stays at the top of the classical charts. 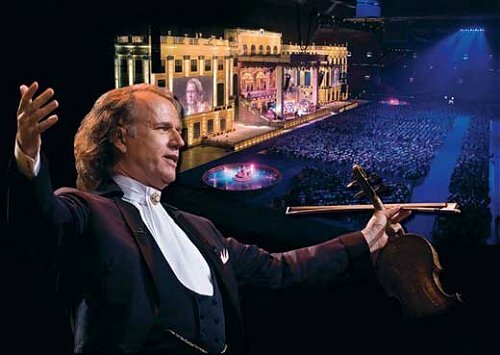 But André Rieu is simply extending classical music's traditional middle aged audience. Who is going to take it to the elusive younger audience? "How should concert halls go about attracting new listeners? Does government play no role in this? Well, the one and only way to interest people in classical music is to get them to play it as children. People who grow up not having learned an instrument or not having been exposed to playing Bach on the piano—or playing, as I did, clarinet in a concert band—they have no understanding and no exposure to it. When I was a kid, we all had music lessons as part of the school program." It's actually very easy to attract those elusive youthful listeners - you just have to wait ten years. I'm 36 and have always loved classical music - and accordingly, I've spent my entire adult life so far surrounded by people with entirely different musical tastes from mine. And now, within these last two to three years, my friends have started coming to me, asking for recommendations about productions at Opera North and WNO, asking about how one goes about buying tickets for concerts by the RLPO and for the Proms (sorry Pliable), and borrowing CDs. I couldn't say precisely why: their tastes have changed; their curiosity has moved in new directions; they simply have more disposable income, perhaps. But they've found their way to the music, in their own time. I'm also involved with running a youth orchestra, with a broad social mix, covering ages 14-21, and repertoire that ranges from Rameau to Tansy Davies and Jorg Widmann. It's oversubscribed by 150%, and the 110-odd members have a thirst for music of all kinds, and an enthusiasm about live performance that feels as if it can move mountains. Add to this a newspaper clipping from the early 1960s that I found in an archive recently - bemoaning the "sea of grey heads" at classical concerts in this particular city, and expressing fears about "an audience for the future", and I find it hard to take the recurring "where are the young audiences?" scares terribly seriously. It's crucially important to keep thinking about all sorts of audience, and to keep examining what we do. But as regards young classical music listeners and performers, the sky has been falling in for several generations now, it seems. I don't want to sound complacent, but this has been my experience. The world of classical music has many urgent issues to address, but I wouldn't put this one particularly close to the top of the list.